Dr. George Parlitsis grew up in Queens, NY. He received his Bachelor of Science degree in Mathematics from the State University of New York at Binghamton. He continued his education and graduated from Columbia School of Dental and Oral Surgery in New York with a Doctor of Dental Surgery degree. After completing a Residency at the Montrose VA Hospital, he began practicing in Carmel, New York in 1988. 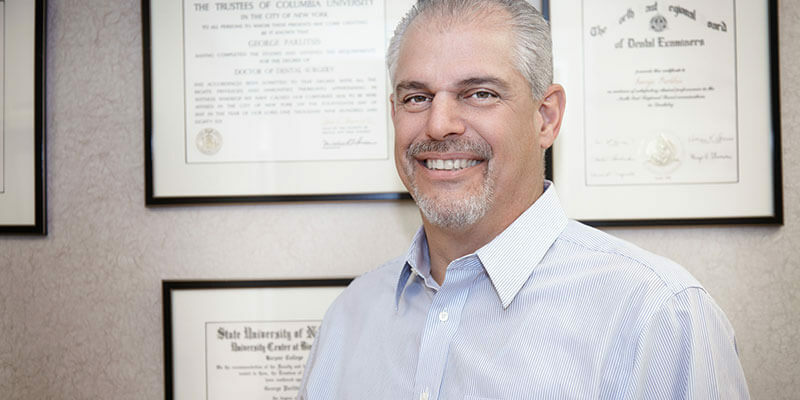 Consistently voted a Top Dentist, Dr. Parlitsis is a member of the American Dental Association and both the Putnam County and the Ninth District Dental Societies. He and his wife have lived in the area and raised both of their children here. In addition to Dentistry, Dr. Parlitsis is an avid sports fan, especially golf.